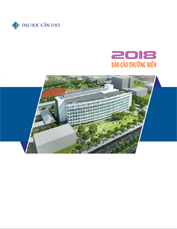 The objective of this study is to assess the surface water quality under impacts of water infrastructure development in the Mekong River in An Giang province for a period of 2010-2014 by using Water Quality Index (WQI). There are seven parameters (Dissolved oxygen (DO), pH, biochemical oxygen demand (BOD), total suspended solid (TSS), nitrate, phosphate, and total Coliform) to be calculatedat 10 stations for three times a year (March, June, September). The values of WQI fall a range of 0 to 100, and areclassified into five levels (excellent, good, medium, bad, and very bad). The resultsshow that the average annual values of WQI rangedfrom 82to 68 at the Tien river and 65 to 80 at the Hau river.Water quality of these two rivers was thereforeclassified as "medium to good" leveland suitable for human uses.However, WQI in March, 2011 at MH5 station (Hau river)was assigned to "bad" level due to very high BOD and total Coliform values. Water quality at this station was bad and unsuitable for domestic water supply.